NASA Offers $2.25 Million For Martian Habitat Design - How Could This Contest Help People On Earth? A 3D-printed habitat for Mars could make human exploration, and eventual colonization, of the planet much easier and less expensive than current forecasts predict, and advances in these technologies could have great benefits on Earth. In an effort to produce such shelters, NASA is offering an award of $2.25 million for the best design for a printable Mars habitat. The 3D Printed Habitat Challenge aims to encourage the development of a space habitat that can be constructed on an alien landscape. Participants in the contest, part of NASA's Centennial Challenges drive, will need to actually build such a structure to show the task can be accomplished. Phase one of the competition is a design contest, aimed at selecting plans which take advantage of the unique capabilities of 3D printers. A total of 30 designs will be selected to move onto the next round, and the top winner will receive $50,000. The Structural Member Competition which comes next will focus on the fabrication technologies needed to construct the shelters from discarded parts from the spacecraft and resources which could be found at a Martian landing site. 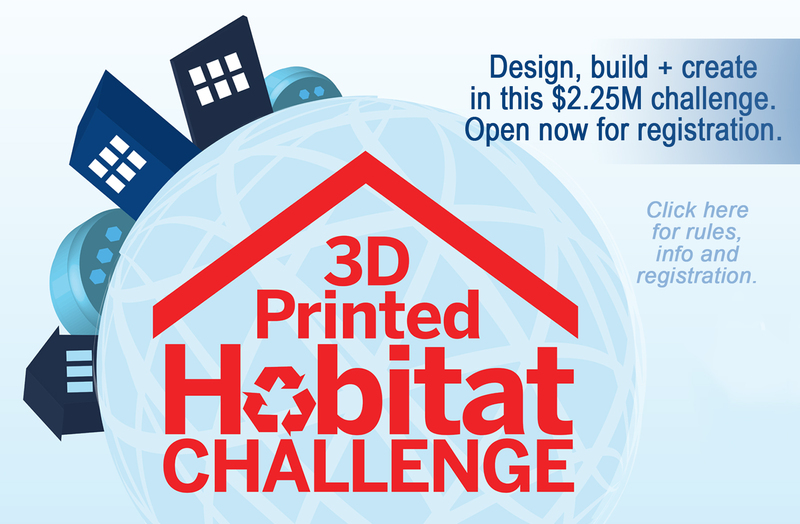 During the On-Site Habitat Competition, the final round in the contest, participants will be required to actually show such a habitat being constructed utilizing 3D printing technology. The top winner in each of the two final stages will be awarded $1.1 million. Information on rules and registration may be found here. Shelter is considered to be one of the basic necessities of life here on Earth, but the harsh environments on alien worlds would quickly kill any human being foolish, or unfortunate, enough to face the conditions without a habitat. However, carrying enough material to construct such living quarters would be prohibitively expensive. Ideally, NASA would like to see a habitat design using waste products from the space vehicle, in addition to resources present on Mars. "The future possibilities for 3-D printing are inspiring, and the technology is extremely important to deep space exploration. This challenge definitely raises the bar from what we are currently capable of, and we are excited to see what the maker community does with it," Sam Ortega, Centennial Challenges program manager, said. Technologies and techniques developed for a 3D-printed Martian habitat could also be applied on our own planet, to assist those without an adequate place to live. In the science fiction series Star Trek, homelessness was ended by the invention of the replicator, which could manufacture homes plentiful enough to house everyone in need of shelter. These designs could also provide assistance in communities recovering from natural or man-made disasters. "If we can solve for the need to ship materials, we can develop solutions for a variety of scenarios, including those for humanitarian and disaster relief efforts on earth, wherever affordable housing is needed and access to conventional building materials is limited," the National Additive Manufacturing Innovation Institute, known as America Makes, reported on its Web site. Amateur and professional designers are encouraged to enter the contest, and submissions may be sent in until Aug. 3. The winners of the first round will be announced at the NYC Maker Faire to be held Sept. 26-27 at the New York Hall of Science. Maker Faire is a forward-looking family-friendly gathering that celebrates resourcefulness and offers a venue for makers who are exploring new forms and technologies to show examples of their work and interact with others about it. It features innovation and experimentation across the spectrum of science, engineering, art, performance and craft.